I am going to share an embarrassing albeit very relevant childhood story with you. When I was a kid, I was fascinated by the news readers on TV. 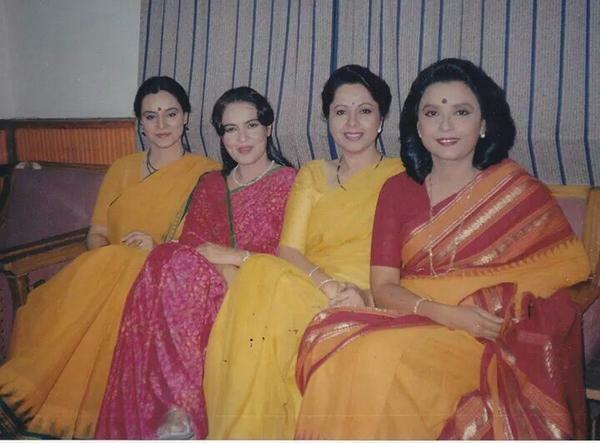 If you are an 80’s kid, you can never forget the signature rose tucked behind Salma Sultan’s ear or the exemplary poise and grace with which Rini Simon or Shammi Narang presented the news every night. Oblivious to the existence of a tele-prompter, I used to memorise lines from the front page of the newspaper and try to imitate the formality while presenting it. Forgotten as this memory has been for so many years, this seemed so relevant when it came to actually facing the camera! And I must confess that it wasn’t fun at all! But I did manage to do a decent job eventually. Read on to know what I learnt from this unique experience. It’s important: One might wonder why did I have to go through the ordeal if I hated it so much! But then audio-visual medium is something one can’t ignore. I have written blog posts. I wanted to offer more on my blog. It’s not easy: After training people for 14 years, it was hard to talk into a camera with no eyes staring back at me. Or nodding in agreement or laughing at my humour. You have no idea how you appear on screen. There can be re-takes if you find the clips not to your liking. It is still unsettling. It’s hard to watch yourself on screen: I still cringe at the thought of watching myself in the clips and worse, give feedback on what I think. Unless you are totally in love with yourself, it is impossible to audit oneself on screen! It’s not impossible: Though not fully comfortable with recording videos, I’ve come to consider it doable! One has to keep at it. And here are a few things I learnt can be done to make it easier for you on the D-day, aka the shoot day! 2. Put a script together: Having an idea of the flow in advance helps. There are so many things to take care of – how you look, the camera angles, the nerves – it’ll be a blunder to be unsure of what to say. 3. Practice: It helped a great deal when I practiced my script in advance. I always got stuck in the middle of one take videos. Knowing my script well kept the flow going. And made me feel more confident! 4. A great team helps: Had it not been for the right support, I don’t think I would have come this far. And I also know how hard it is to find the right people to work with. Keep looking and you will find the right match sometime. A great team who knows their job well is always a bonus! 5. Record informally: This is like riyaz that musicians do to hone their skills. Whether or not they have a a gig coming up, they put in hours of practice to perfect their craft. Although, I have been behind on this, recording yourself for practice on your phone can greatly take care of jitters on an actual shoot day. You will be more comfortable, understand how your body language works, learn to get your voice right – you can only benefit by practicing on your own. 6. Get trained by a professional: The way we talk can sound very different on a video. There is some amount of control required while speaking into the mic. Voice exercises help open up vocal chords and warm up the voice. A voice coach can help you work on your voice and make it recording ready! Although there aren’t many resources on becoming camera ready, the book, Confessions of a Public Speaker by O’Reilly has a whole chapter on it. Apart from this, I found this amazing article online where Turnbull shares his personal experiences of how to be confident in front of the camera. He has quite a few solid tips one can follow. Who is your inspiration for onscreen presence? Amitabh Bachchan is definitely someone I admire for his amazing vocal variety. I’d love to know yours! You can watch the latest video series on how to become a confident speaker on my channel.